Vitamin B5 and vitamin B6 are water-soluble vitamins. Water-soluble vitamins cannot be stored by the body, so they must be continuously supplied by diet. B vitamins help the body use energy from food, according to the National Institutes of Health. They also help form red blood cells. Both vitamin B6 and vitamin B5 are involved in protein metabolism. Vitamin B6 is also required for red blood cell metabolism, immune system response and blood sugar regulation, according to the National Institutes of Health. It is needed to convert the amino acid tryptophan into the vitamin niacin. Vitamin B6 is also required to make hemoglobin. 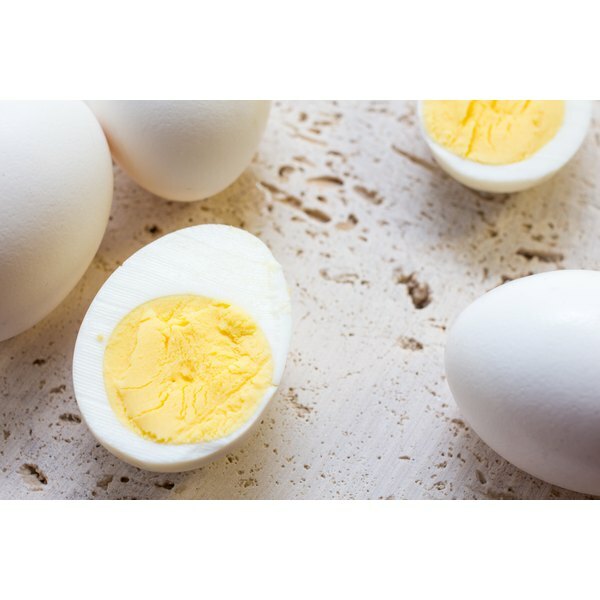 Vitamin B5 is needed for the synthesis of fats, cholesterol and steroid hormones, as well as the synthesis of acetylcholine, a neurotransmitter, and melatonin, a hormone, according to the Linus Pauling Institute at Oregon State University. Deficiency of vitamin B5 or B6 is rare. Vitamin B5 deficiency has been found to result in headache, fatigue, insomnia, intestinal disturbances and numbness and tingling of their hands and feet, although this result was not replicated in a subsequent study, according to the Linus Pauling Institute of Oregon State University. Adults should have at least 5mg per day of vitamin B5. Alcoholics may be at risk of vitamin B6 deficiency because of trouble metabolizing the vitamin and poor nutrition. Deficiency could result in neurological symptoms, including seizures, irritability, depression and confusion. Adults should have 1.3mg per day. Men older than 50 should have 1.7mg per day. Women older than 50 should have 1.5mg per day. Vitamin B6 may play a role in lowering blood homocysteine levels, reducing risk of heart attack and stroke, according to the Linus Pauling Institute of Oregon State University. Pantethine, a derivative of vitamin B5, may also play a role in preventing heart disease by lowering cholesterol and triglyceride levels, according to the institute. Vitamin B6 has been used to treat premenstrual syndrome and side effects of birth-control pills and has been suggested as a treatment for depression, but no conclusive evidence has found that it is beneficial, according to the Linus Pauling Institute. It may be helpful for reducing morning sickness in pregnancy. Vitamin B5 may accelerate wound healing, although more research needs to be done. Both vitamin B5 and vitamin B6 are found in fortified cereals, grains, meats, fish, dairy and beans. Vitamin B6 is found in some fruits and vegetables. Rich sources of both vitamin B5 and vitamin B6 include liver, egg yolk, sunflower seeds, pistachios, salmon and tuna. Shiitake mushrooms are a source of both vitamins. One cup contains 52 percent of the recommended daily consumption of vitamin B5 for those on a 2,000-calorie diet, according to the USDA National Nutrient Database for Standard Reference.